Today Sony announced the Xperia X series at Mobile World Congress in Barcelona. The new phones focus on performance in two core areas: camera and battery. 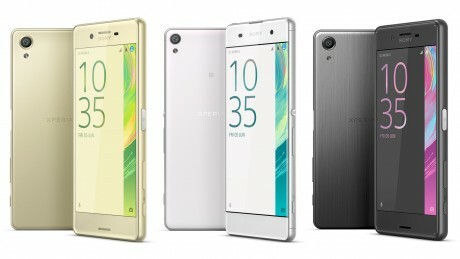 The first three phones in the X series are the Xperia XA, Xperia X, and Xperia X Performance. The new-generation camera in the X and X Performance sports predictive hybrid autofocus. The X series battery lasts two days and includes adaptive charging tech from Qnovo that extends battery lifespan up to 2x. The Xperia X is the base model with a Qualcomm Snapdragon 650 processor and 5-inch full HD display. It also sports a 23-megapixel main camera and 13-megapixel front camera. A fingerprint sensor, memory card slot, and NFC are also included. The Xperia X Performance steps up to a top-end Snapdragon 820 processor, faster LTE and a waterproof design, but it otherwise identical to the X. The Xperia XA is a lower-range phone with a 5-inch display that is 720p instead of full-HD. However the XA has a bezel-free design that makes the phone exceptionally narrow. The XA runs on a MediaTek processor and its cameras are 13 megapixel, and 8 megapixel in the front. It does not have a fingerprint reader but does have NFC and a memory card slot. All three models have similar designs using curved-edge front glass and metal back and/or side elements. The phones will ship this summer, although pricing and regions have not yet been announced. Sony today said it plans to bring its Xperia X range of handsets to the U.S. market beginning in June.